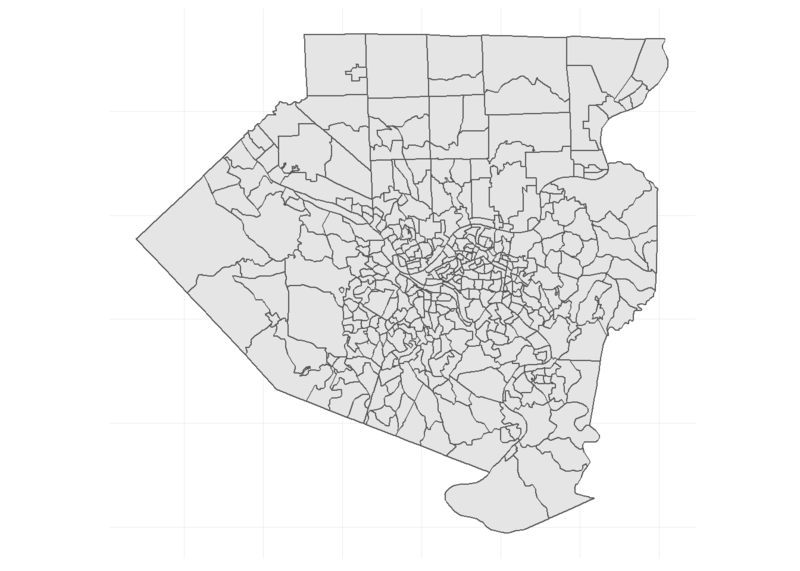 In this post I will use the census API discussed in the last post to cluster the Allegheny County census tracts using PCA and k-means. 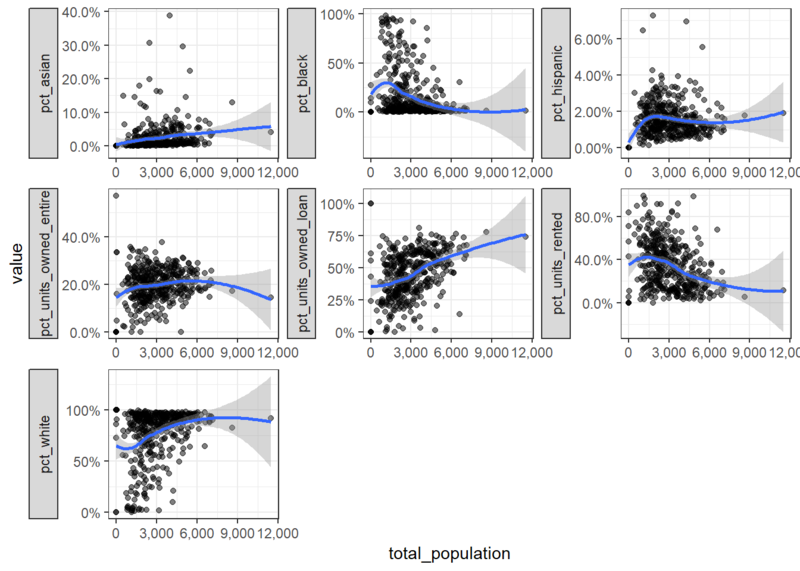 This code downloads data about the ethnicities resident in the tracts and calculates them as a % of the tract population. This code downloads information about the housing stock in each tract, specifically what % of housing units are owned outright, owned with a loan, or rented. This code requests the total population of each tract. This code requests the geometry of each tract that I will use to map them later. This joins the 4 dataframes together. This graph compares the percent of white residents to the remaining variables in the data. pct_white is on the x axis of each of the smaller charts. Note that each chart’s Y axis has its own scale. It is already obvious that pct_white and pct_black are negatively correlated with each other. 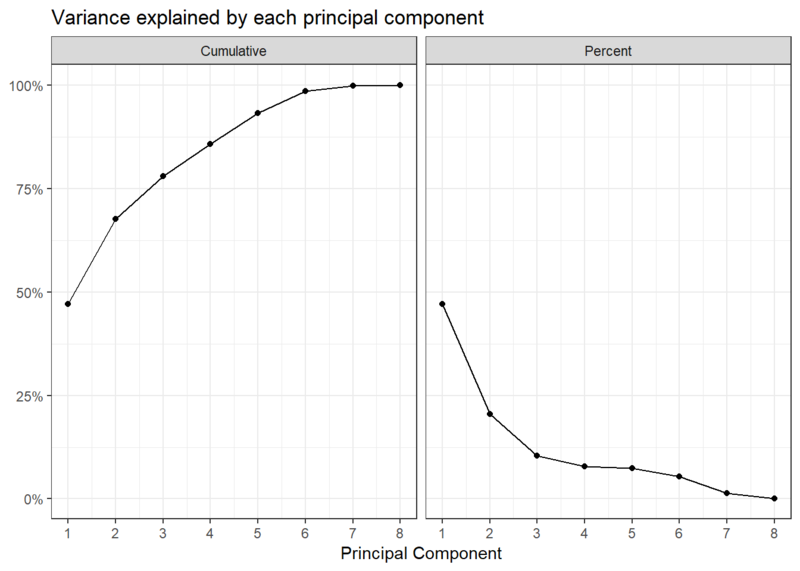 This shows how the PCs explain the variance in the data. As explained earlier, the first few PCs explain most of the variance in the data. 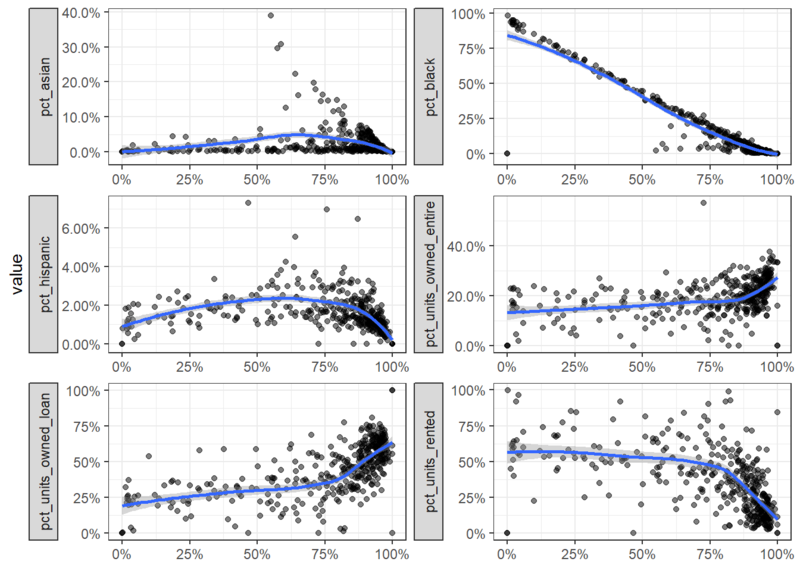 This shows how the PCA function rearranged the data to maximize the variance in the first few PCs. PC1 is largely defined by the percent of a tract that is white or black, the percent of housing units that are owned, and the total population of the tract. 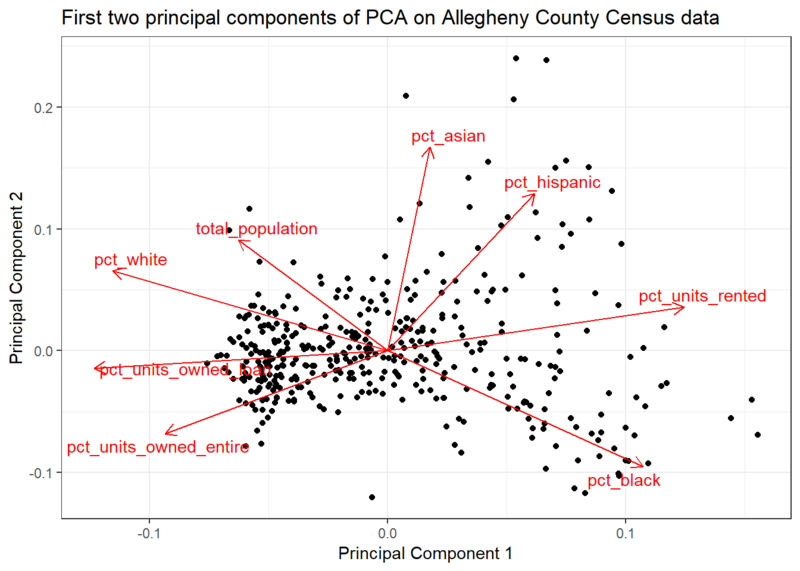 The “pct_white” and “pct_black” arrows point in opposite directions, which reflects Pittsburgh’s status as a segregated city. PC2 explains less of the variance, and is influenced by the percent of a tract that is hispanic, asian, or black. This code maps the first two PCs to the tracts. Next I will use k-means to cluster the PC data. This code clusters the data using 1 to 9 clusters. Based on this “elbow chart”, the optimum number of clusters is most likely 2. 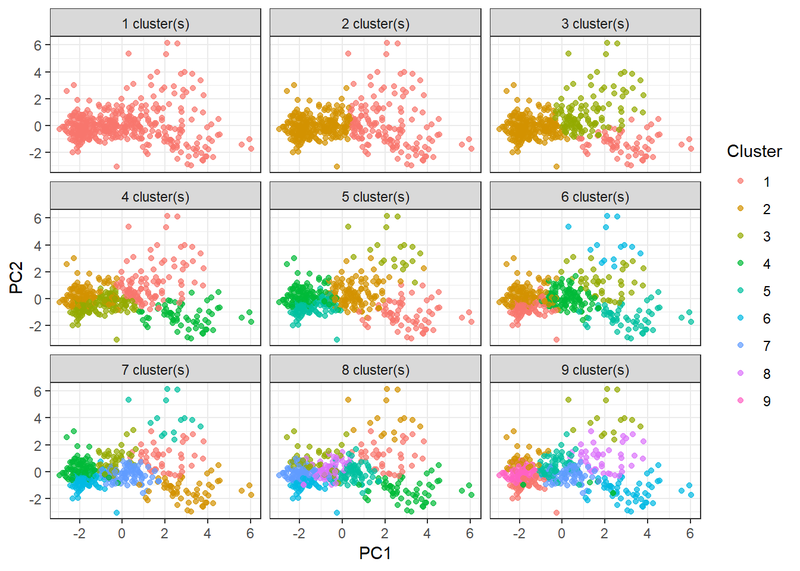 We can visualize how the data would look if it were assigned to a different number of clusters. 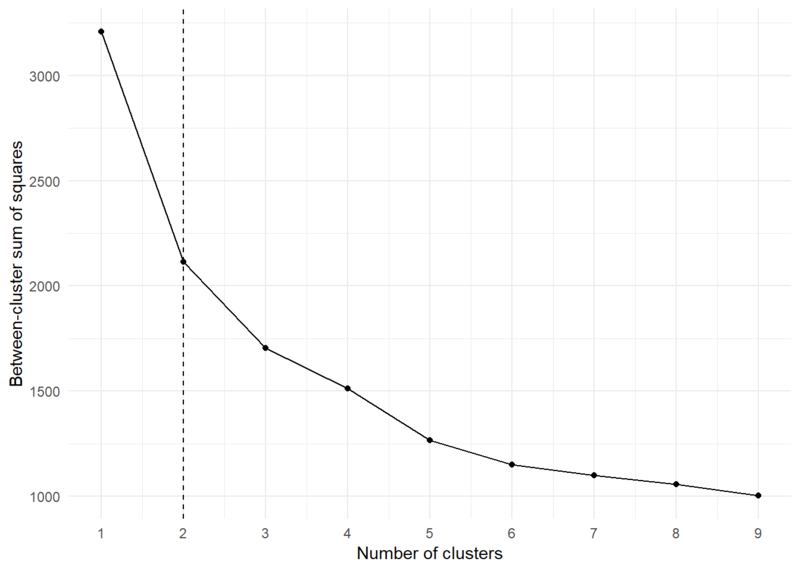 Clearly the clustering algorithm experiences diminishing returns after 2 or 3 clusters. This code divides the data into 2 clusters and maps the clusters onto the tract map. 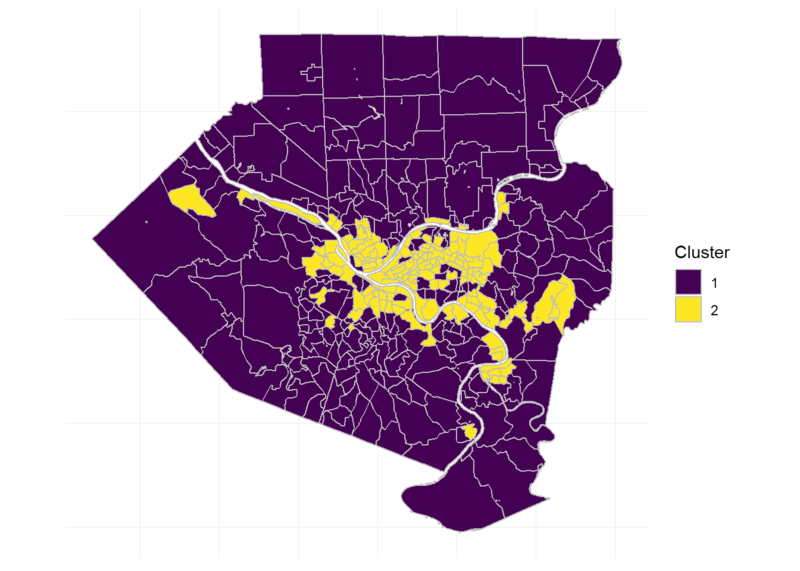 The second cluster largely follows the city limits, but excludes areas such as Mount Washington, Squirrel Hill, and Shadyside. It also includes a few areas outside of the city like Duquesne and McKeesport.